At TriStar Vet, our engineers designed the industry’s sturdiest stainless steel dog kennel panels for attractive, high-functioning facilities. If the most prominent surface of your veterinary kennel floor plans is your side panels — why not choose top-performing, great-looking designs for years of enjoyment? Whether you choose the sleek look of hand-polished stainless steel or our bold, color-rich Starlite panels, we can provide a custom solution to fit your kennel floor plan. 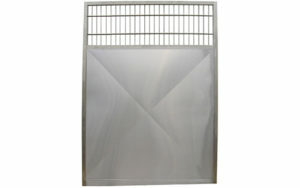 Our stainless steel kennel side panels are designed for maximum durability while buffering sound. We start with double wall 20-gauge stainless steel sheet metal and add a high-density foam lining that reduces noise. And of course, we seal all edges to help keep them free from fur, urine & feces. 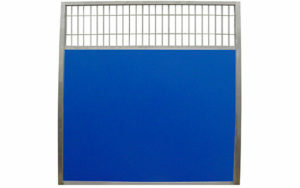 Our colorful Starlite kennel side panels offer attractive styling with lasting strength. We start with a hand-welded, heavy duty TYPE 304 stainless steel frame and add stainless steel rods at the top for ventilation. Our 48” H Starlite kennel wall is FDA approved and built to resist abrasion, moisture, stains and odors and stands up well to cleaning chemicals. Available in 4 attractive color choices. Both styles of our dog kennel panels are a standard 75-1/2” High with standard widths available: 48”, 60”, 72”, 84” and 96”. Which dog kennel panel designs are right for your facility?